Home > Blog > How to Enforce a Non-Compete In Arizona? Employers require their employees to sign non-compete agreements in hopes of restricting the employees from using the relationships (with other employees, vendors, and customers) that they developed while working for the employer to directly compete against the employer after termination. Despite the wide use of non-competes, many employers are not clear on 1) how to prepare to enforce a non-compete agreement in Arizona, and 2) how to enforce a non-compete agreement in Arizona. Here are five things to consider when trying to enforce a non-compete agreement in Arizona. 1) Do I have a signed copy of the non-compete agreement? While this is very basic, it can be a problem if an employer has failed to safeguard the signed copies of the non-compete agreements. It does not mean that the employer has no case, but it will make enforcing the non-compete agreement much more difficult as the employer will need to first prove that the employee did in fact sign the agreement. 2) Is the non-compete agreement overly broad? Even if an employer has a signed non-compete agreement, it is important to analyze whether the non-compete is too broad. For example, if the employer sells t-shirts only in Arizona, but the non-compete says the employee cannot work for any t-shirt company in the world after employment, that will be problematic. 3) Was there valuable consideration given when the non-compete agreement was signed? If an at-will employee signed a non-compete agreement at the start of their employment, or even in the middle of their employment with the employer, Arizona courts have found that continued employment of the at-will employee acts as valid consideration for that employee. However, if an employer requires an employee to sign a non-compete just before they are fired, then there may not be valid consideration for the non-compete. Additionally, if the employer has an employee sign a non-compete agreement, terminates the employee, then rehires them without a new non-compete, chances are the employee is not subject to the previous non-compete agreement. 4) Does the employee’s new employer compete with your business? When determining whether to pursue enforcement of a non-compete agreement, it is important to review whether there is any competition actually taking place. Remember, the courts do not favor non-compete agreements and will enforce them only if they do not unnecessarily restrict an employee’s right to work and make a living. Using the example from question 2, if your company makes t-shirts, and the employee leaves to work for a construction company, it is unlikely that the non-compete will be enforceable. 5) Does your inaction set a precedent for other employees? Non-compete agreements are either effective or useless depending on whether they are enforced by the employer. If employees learn that an employer will not enforce the non-compete agreements, then it is as if the non-compete agreement does not exist. Sometimes it is important to enforce a non-compete agreement to set a precedent for other employees to know that the employer takes the non-compete agreement seriously. Depending on your answers to these questions, the next step is to enforce the non-compete agreement. Here are some basic steps to enforcing a non-compete agreement in Arizona. Is my Noncompete Agreement Enforceable? | Denton Peterson, P.C. 1) The first step you may take to resolve a non-compete agreement breach is to send a cease and desist letter to the employee and the employee’s new employer with the employee’s non-compete agreement attached. Often times these are sent by legal counsel for the employer and have citation to case law and other relevant language to put the new employer and the employee on notice of what will happen if the employee continues to be employed by the new employer. A cease and desist letter is not mandatory under the law, but it can be a cost effective way to resolve the dispute. 2) The next step is to file a lawsuit. This likely will not be a typical lawsuit where an employer will only file a Complaint. Instead because there is immediate harm taking place by the employee’s breach of the non-compete, an employer should also file a Temporary Restraining Order and a Request for a Preliminary Injunction. 3) The temporary restraining order is a request that the court immediately stop the employee from working for the new employer until a preliminary injunction hearing can be held. This is done by an attorney actually going to the courthouse and meeting with the judge when filing the Complaint. The judge can either grant the temporary restraining order, or deny it and wait to make a decision at the time of the preliminary injunction hearing. 4) The request for a preliminary injunction is a request to have the court preliminarily hear evidence on the isolated issues of whether the employee should be prohibited from working for a specific new employer or not. It is “preliminary” because the underlying lawsuit as found in the Complaint will still be ongoing and the Court will make a final determination (or a permanent injunction) only after the entire lawsuit has been resolved. The preliminary injunction will not be a chance to obtain an award of damages. That will happen only through the underlying lawsuit. There are many nuances to appropriately filling a temporary restraining order and a preliminary injunction. 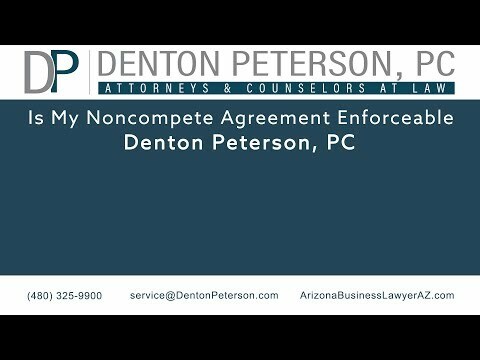 If you are considering enforcing a non-compete agreement against an employee, please contact the Mesa employment lawyers Denton Peterson PC to help you.